Building on a long tradition of effective pedagogy and comprehensive coverage, T The Cosmic Perspective: Stars, Galaxies, and Cosmology, Eighth Edition provides a thoroughly engaging and up-to-date introduction to astronomy for non-science majors. This text offers a wealth of features that enhance student understanding of the process of science and actively engage students in the learning process for key concepts. The fully updated Eighth Edition includes the latest scientific discoveries, revises several subjects based on our most current understanding of the cosmos, and now emphasizes deeper understanding of the twists and turns of the process of science and the relevance of concepts to student’s lives. The text is supported by a robust package of instructor and student ancillaries, including MasteringAstronomy. This market-leading online tutorial and homework system has been updated with new content that helps students learn and review more effectively outside of class. 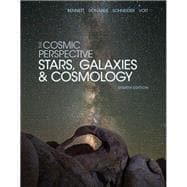 The Cosmic Perspective: Stars, Galaxies, and Cosmology, Eighth Edition includes Chapters 1-3, S1, 4–6, S2–S4, 14–24. MasteringAstronomy from Pearson is the leading online homework, tutorial, and assessment system, designed to improve results by engaging students before, during, and after class with powerful content. Instructors ensure students arrive ready to learn by assigning educationally effective content before class, and encourage critical thinking and retention with in-class resources. Students can further master concepts after class through homework assignments that provide interactivity, hints and answer-specific feedback. The Mastering gradebook records scores for all automatically graded assignments in one place, while diagnostic tools give instructors access to rich data to assess student understanding and misconceptions. Jeffrey Bennett, a recipient of the American Institute of Physics Science Communication Award, holds a B.A. in biophysics (UC San Diego) and an M.S. and Ph.D. in astrophysics (University of Colorado). He specializes in science and math education and has taught at every level from preschool through graduate school. Career highlights including serving 2 years as a visiting senior scientist at NASA headquarters, where he developed programs to build stronger links between research and education, and proposing and helping to develop the Voyage scale model solar system on the National Mall (Washington, DC). He is the lead author of textbooks in astronomy, astrobiology, mathematics, and statistics, and of critically acclaimed books for the public including Beyond UFOs (Princeton University Press, 2008/2011), Math for Life (Big Kid Science, 2014), What Is Relativity? (Columbia University Press, 2014), and On Teaching Science (Big Kid Science, 2014). In 2014, his five children’s books (Max Goes to the Space Station, Max Goes to the Moon, Max Goes to Mars, Max Goes to Jupiter, and The Wizard Who Saved the World) became the first books launched to the International Space Station for the Story Time From Space program. He and his family live in Boulder, Colorado. His personal website is www.jeffreybennett.com.